Now, if you’ve driven by this house on Chavez and given it a first thought, much less a second one, I’d be surprised. While I don’t spend much time in the area, I can say I’ve never noticed it. Three of the four books I’ve seen mentioning this landmark refer to this one-story structure’s broad floor plan as an indication that, at some point, the builder had intended to add a second story and then, at some other point, abandoned the idea. If you see the home in person, I bet you’ll agree this was the case. … arrived at the only real hotel in town, the Bella Union, where stages stopped and every city function took place. This hotel was a one-story, adobe house enlarged in 1858 to two stories, and located on Main Street above Commercial; and Dr. Obed Macy, who had bought it the previous spring from Winston & Hodges, was the proprietor. The elder Macy arrived in Southern California around 1850, settling in El Monte. He moved downtown a year later, bought the Bella Union, and opened the Alameda Baths. He died on July 19th, 1857. Oscar Macy was a newspaper editor and businessman, also serving as city treasurer during the 1880s. 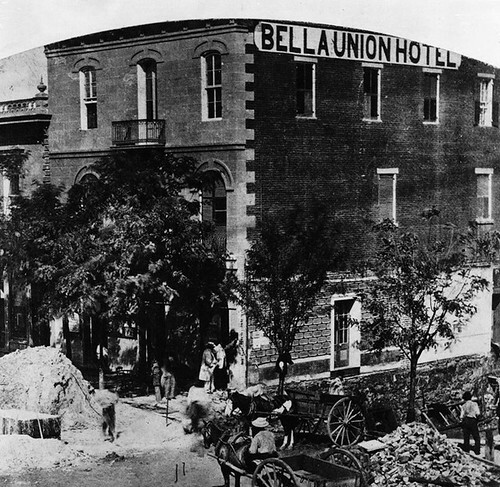 The Bella Union was the home of the Los Angeles Star newspaper, had served as the County Courthouse, housed Pio Pico, and was later the site of a celebration when the telegraph connected San Francisco and L.A. (1860) among many other notes. The hotel became the Clarenden in 1873 and the St Charles in 1875. The Bella Union building was razed in 1940 (and the Pico Building (1868), shown in the picture next to the hotel, was torn down in 1957). But I digress; enough of the Macys and the Bella Union Hotel. Historic-Cultural Monument No. 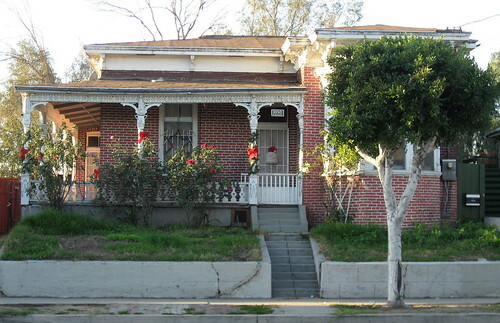 102 is this brick home, standing here for about 130 years, an unassuming piece of L.A. history. 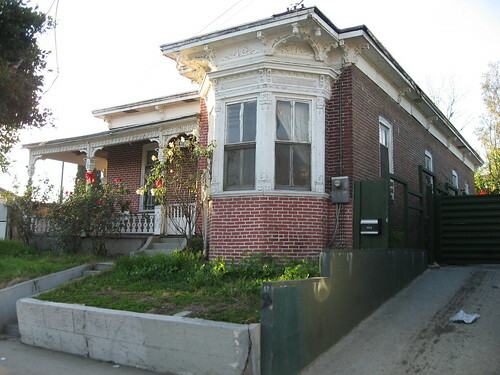 This house at 1030 Cesar Chavez Ave (formerly Macy Street) was originally the home of Romaine Grand, a French Basque immigrant and land developer for whom Grand Avenue in downtown was named. 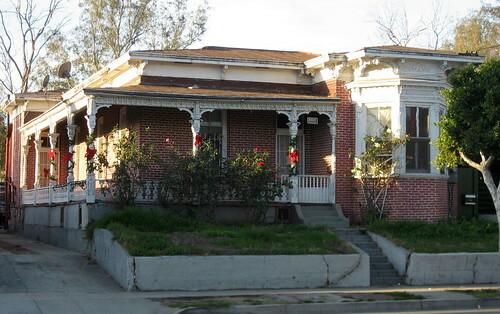 It was built in the mid 1870's and is one of the oldest remaining brick houses in Los Angeles. Wow, what great information. Thanks a ton, Steve. I can't say that I've ever seen while I lived in California but have seen plenty of old homes here in the Florida Panhandle. I really enjoy the character these homes have and that people are still living in them. History preserved for all to see up close and not just in a book. I lived next door to this house as a child. ( I'm 85)The house is of same vintage ,but not as elaborate. From there we moved to a little street at the foot of the bridge that is the last overpass of the San Bernatdino freeway as it merges with the Sant anna freeway.I have just completed a collection of vignettes about growing up poor and Mexican during the Great Depression. I tell about walking over the Mamcy st. Bridge countless of times. Gathering wood scraps for our stove when the Union Station was being constructed. The trolley that traveled to and fro. Not intended as an Auto-biography my recollections cross ethnic lines,and seem to have a universal appeal. i would love to send you a vignette or two for your comments. May i add that i am overawed by your work. Thank God for persons like you. Thank you, La Prima Elisa. Your site and family research is wonderful. I'm sure your blog represents a small portion of the rich lives you and you family must have led. I'd be honored to add any information, stories, or photographs you'd be willing to share. You may email them directly to bigorangela at gmail dot com. My friend and I Drove past this lovely house today. Unfortunately, its looking a little shabby and it had a large For Sale sign on the lawn. The worrisome part was that it looked a like a commercial property sale sign. (I just did a quick search and haven't found a residential property listing) Does anyone else know what the status on this house is? I love the Italianate style, it very much reminds me of the Perry-Mt. Pleasant house that was once up the hill from this one and now at Heritage Square. 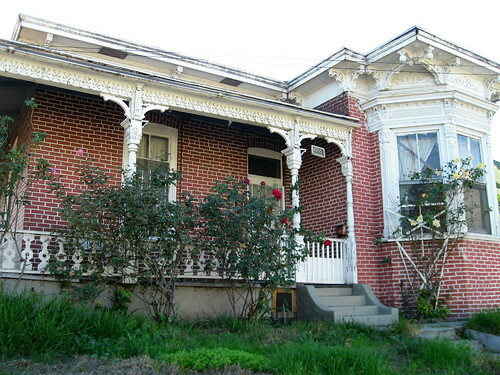 Also, in answer to your first question, I know of one other Victorian home in LA that is made of brick/masonry. Its in Pico-Union at 1431 Valencia St. Its a fantastic one story Eastlake house with a large front porch. I haven't done research on the house, but it appears to currently house some sort of religious organization and Zillow says it was bulit in 1897. Not sure if this house has any sort of landmark or protection status, but I think it really should. Its a pretty unique house! Hi, Tillie, and thank you for the comment. Have you got any vintage photos of the house or neighborhood you'd like to share? Sad to say as I type this the house at 1030 cesar e chavez is a mess. Restoration without any permits, porch roof is missing, screen doors long discarded, bricks trashed and gone, sewage and electrical replaced etc. I filed a complaint with LADBS on 12/12/13, no one has been out yet. Department of city planning claims the property has no historical monument status or protection and gave me a copy of PPR much different than all the other sites have for his property and the carnage going on there is not that urgent. Maybe I didn't dot my i's or cross my t's and everything is status quo. Drive by and have a look. Eugene Biscailuz (also Basque), former Sheriff of Los Angeles County, and Leo Carillo, actor, also lived in the immediate neighborhood (I believe Leo Carillo actually lived next door to 1030 Macy St. at one time). They all knew each other (Romaine Grand, Biscailuz and Carillo). The Pelliser family, the Foix (bakery) family, and the Taix (restaurant) family were also Boyle Heights Basque families in the early 1900's. The Leonis family of Calabasas were cousins of the Grands (the Grand family's original Basque name was "Hartacorina", but they anglicized it to "Grand"). John Grand, my grandfather, Romaine's son, was also a real estate investor and had a small grocery store at 1701 Brooklyn Avenue - corner of Boyle Avenue - for many years. My great great grandparents owned this house from 1949-2007. We moved out 8-1-12 because it was bought by this guy to be turned into apartments but he has been told that due to its historical significance he can only fix it to its original version.